Breakfast and Veg Snack Recipes to control Acidity! Breakfast and Snack Recipes to control Acidity! breakfast acidity recipes. snack acidity recipes. Indian breakfast acidity recipes. From Milkshakes, Smoothies, non-fermented dhoklas to pancakes and of course all-time favourites Parathas and South Indian delicacies, these acidity-friendly recipes will surely brighten up your day. These subtly-flavoured chillas are really trendy because they are easy-to-prepare, tasty and stomach-friendly too, which is a key concern for many people! These Nutritious Chilas are made with Ragi Flour, jowar and Whole Wheat Flour, perked up with just a mild dash of green chilli paste. A good amount of veggies are added to keep the chilas soft and to lend a lovely crunch to them. Another healthy option is mooong dal and paneer chila recipe. You can have these tasteful chilas anytime, for Breakfast or as a Snack, so you can ward off hunger and associated acidity bouts too. When you want to counter acidity, the regular dosa and idli are not advisable as they are fermented food. So we have the solution for you. Make this instant buckwheat dosa recipe without fermentation and the beauty is that this is a diabetic friendly recipe and heart friendly recipe. Choose between pudina lemon tea or apple tea. For those who love the traditional Indian teas, we have the elaichi tea though it has loads of sugar. For those who love ginger in the morning you can have the ginger tea or honey ginger tea recipe. 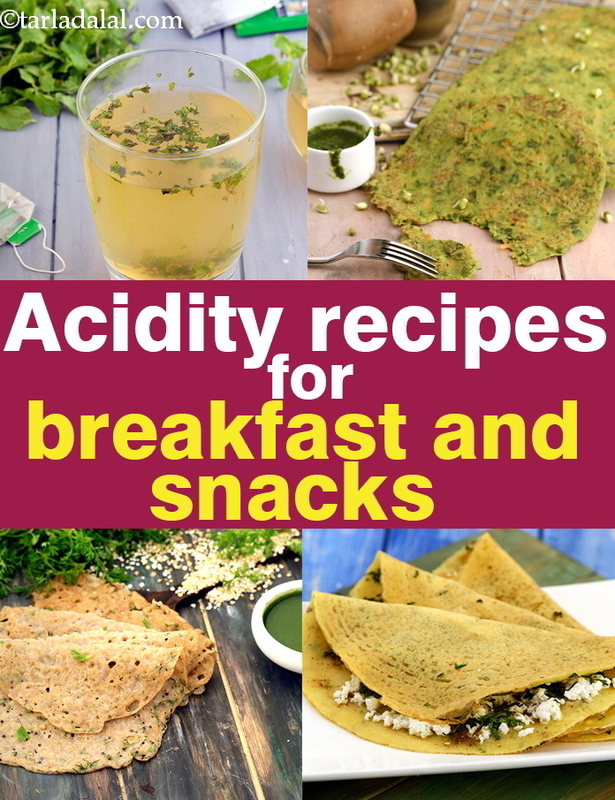 Enjoy our collection of breakfast acidity recipes. snack acidity recipes and acidity articles below.